Updates to Barbara Ellen's profile since your last visit are highlighted in yellow. Barbara Ellen Beachum Kanipe posted a message. New comment added. Hope you had a wonderful birthday and wishing you all the best in the coming year. Barbara Ellen Beachum Kanipe posted a message. Happy Birthday, James. Hope you had a great one, and a wonderful year ahead. Barbara Ellen Beachum Kanipe added a comment on Profile. New comment added. Barbara Ellen Beachum Kanipe has a birthday today. Happy thanksgiving and a belated HAPPY BIRTHDAY. Wishing you a wonderful year ahead! Barbara Ellen Beachum Kanipe posted a message on Flapper McCutcheon's Profile. Hi! Happy Thanksgiving and HAPPY BIRTHDAY!! Will call you later. Love you. Barbara Ellen Beachum Kanipe added a comment on Profile. 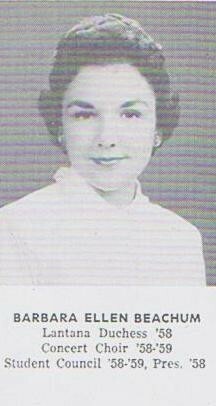 Barbara Ellen Beachum Kanipe added a comment on Martha Sue Prather Wright's Profile. Barbara Ellen Beachum Kanipe added a comment on Gerald Dean Hallmark's Profile. Got your beautiful card today. Plan to call you tomorrow. Love yall???? Barbara Ellen Beachum Kanipe has a birthday today. New comment added.